- Welcome to our web site. We are a small enthusiastic group of people of all ages & Ability. 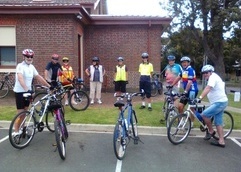 The club rides every Monday, Tuesday and Wednesday. All rides have a stop for coffee, cake & a laugh. New riders are encouraged and if the ride seems too long, one of our members will ride with you part of the way until you build up your stamina and confidence.